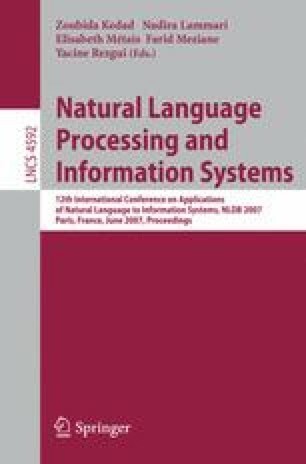 The application of the multilingual knowledge encoded in Wikipedia to an open–domain Cross–Lingual Question Answering system based on the Inter Lingual Index (ILI) module of EuroWordNet is proposed and evaluated. This strategy overcomes the problems due to ILI’s low coverage on proper nouns (Named Entities). Moreover, as these are open class words (highly changing), using a community–based up–to–date resource avoids the tedious maintenance of hand–coded bilingual dictionaries. A study reveals the importance to translate Named Entities in CL–QA and the advantages of relying on Wikipedia over ILI for doing this. Tests on questions from the Cross–Language Evaluation Forum (CLEF) justify our approach (20% of these are correctly answered thanks to Wikipedia’s Multilingual Knowledge). This work has been developed in the framework of the project QALL-ME, which is a 6th Framework Research Programme of the European Union (EU), contract number: FP6-IST-033860.